I’m back, folks. After a long absence devoted to settling into a new life in France with all that entails I offer a new post for your consideration. 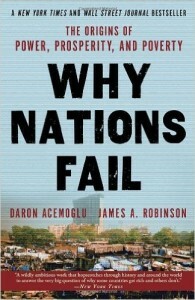 It takes a somewhat different form from my earlier offerings, to which new readers are enthusiastically referred, in that it is my review of an interesting book called Why Nations Fail, by David Acemoglu and James A. Robinson. I found that the book provided a useful perspective on an important question. The book is easy to read and provides a historical narrative that anyone with even a modest interest in the field of economic and political development might find interesting. At the end of the review I offer some reflections of my own that were stimulated by the book. All readers are invited to contribute their own reactions and ideas in the comments section at the bottom of the post. This is my first attempt at a book review so the readers’ patient indulgence (and constructive criticism) is respectfully requested. History Matters! At l east in terms of economic development, where we are going is heavily influenced by where we have been. That is the central theme of this important 2012 book by Daron Acemoglu, Killian Professor of Economics at MIT, and James A. Robinson, David Florence Professor of Government at Harvard. I don’t know why it took me three years to find this book. Now that I have, I want to recommend it to others who, like myself, are troubled by the question of why some nations seem to move from one stage of development to the next while others remain mired in a bog of corruption and poverty regardless of our many efforts to help. The authors rely much more heavily on historical anecdotes to make their case than impenetrable econometric models that leave the non-academics among us, myself included, somewhat glassy-eyed. The book is very well constructed. Perhaps not qualifying as a certified “page-turner” I did find it easy to read and engaging. The authors look back through colonial history and beyond to see how political and economic institutions have developed in countries as diverse as Peru, Mexico the Democratic Republic of Congo, the United Kingdom and others, and how those developments still effect the economic status of those countries today. The crux of the argument is that a country’s economic development is heavily influenced, though not irreversibly determined, by the nature of the institutions its people have developed over time; the rules influencing how the economy works and the incentives that motivate people. The contrast is made between what the authors call “inclusive” and “extractive” political and economic institutions. Extractive political and economic institutions concentrate power in the hands of a narrow elite and place few constraints on the exercise of this power enabling them to extract resources from the rest of society. Examples of extractive institutions are drawn from ancient African kingdoms, colonial administrations around the world and 20th (and 21st) century communism. Extractive institutions are generally seen as being impediments to economic growth. By contrast, inclusive political and economic institutions share power broadly and encourage participation of the great mass of people in economic activities that make the best use of their talents. Inclusive institutions are generally supportive of economic growth in a society. I personally found the use of the term “institutions” in referring to these cultural norms and practices somewhat awkward. I would think more easily about the comparison of “autocrats” and “democrats” but that is perhaps more my problem than the authors’. The clearest case the two authors make in comparing the results of the two systems is the contrast between the economic and political developments of North and South Korea since the 1950s. Starting from the same point at the end of WWII, the newly divided country rapidly developed contrasting/competing economic and political institutions that the authors argue are responsible for the rapid divergence of economic development results. While this case is very easy to see, one might legitimately question the validity of generalizing from a single example. The inclusion of numerous other examples, some of which are considerably farther removed, adds confidence in the authors’ conclusions. In making their case, the authors also make convincing arguments against other explanations for the fact that some nations move ahead and others don’t. They specifically consider the “Geography”, “Culture”, and “Ignorance” hypotheses with arguments that I found both interesting and compelling though somewhat cursory. They do accept the possibility (demonstrated fact) that economic growth can take place in nations with extractive political and economic systems – but only for a period. They argue for example, and correctly in my view, that the Chinese “miracle” cannot last since it is based on a foundation of extractive institutions and strong centralized control. As is so often the case with an academic work like this, the weakness is in the consideration of how to use the findings to be more effective in our development efforts in the future. The authors would probably argue that this is not their job. They devote a very brief section (4 ½ pages) to a declaration of the “Failure of Foreign Aid” (page 450-455). In making this declaration they really only consider the large scale programs that so often end up enriching corrupt government officials, vendors and service providers. They offer some debatable conclusions about the inefficiency and ineffectiveness of these programs and then admit that some good is done (e.g. building schools). They laud the efforts of the Millennium Challenge Corporation to increase conditionality (e.g. increasing government transparency or policy reforms) in programs to finance large scale programs but then argue that these are not effective because corrupt government officials (extractive institutions) are not likely to give up any of their power for the relatively modest short term profits to be gained from skimming the programs – and they just might be able to find ways to do that anyway. They offer no comment at all on the value of institutional or individual capacity building. They are also disdainful, at best, of the serious efforts being invested by committed development professionals around the world to do something constructive without spending enormous amounts of money. Their assertion that only about 10% (or at most 20%) of aid ever reaches its target is simplistic at best and jingoistic at worst. Ocemoglu and Robinson suggest two important lessons on foreign assistance (page 454-455). First is that “foreign aid is not a very effective means of dealing with the failure of nations around the world today.” Second is that, “since the development of inclusive economic and political institutions is key, using existing flows of foreign aid, at least in part, to facilitate such development would be useful.” These are two conclusions with which I expect few of us would argue. They are, unfortunately, of limited usefulness in helping us to think of what concrete changes might be made to make foreign assistance programs more effective. In the final few pages of the book the authors suggest that a (the?) major key to developing inclusive institutions in systems that were previously dominated by extractive institutions is the empowerment of a broad cross section of society that demands change. Beyond suggesting that a free press is fundamental to this empowerment they have little to say about how it can be achieved. In fact, the examples mentioned (the Scania strike in Brazil, the French Revolution) suggest a sort of spontaneous combustion sparked by rising dissatisfaction among a broad cross-section of society. Recommendation: Why Nations Fail has earned a place on my bookshelf and I expect that many of you will find it interesting as well. I must say that these arguments have made me somewhat more appreciative of the many “governance” or “democracy” building projects I have seen around the world. I still believe that many of them that governments are forced to accept as the price of receiving other (bigger?) money from the likes of the World Bank or MCC are largely a waste of scarce resources. The reason many governments have ineffective or corrupt policies and institutions is that the leaders profit from them. How many programs to reform central bank or tax collection procedureshave we all seen that came to naught? Efforts to change those institutions before they really have a strong desire to make change are futile. On the other hand, well-planned and executed programs to empower citizens individually or in groups might eventually result in the type of “spontaneous combustion” referred to above. Empowerment can be achieved in any number of ways. It need not involve a frontal attack on entrenched bureaucratic, political or financial interests that could expose citizens to physical, social or financial harm. The most basic tool for helping people to empower themselves is education. By learning more, they can gradually build their influence over the systems within which they live. Education can, of course, also be delivered in a number of ways. Education programs might focus on building more schools (schools for girls, technical schools, rural schools, etc.) and training more teachers but these things do little good if ongoing support for operating the schools is missing. My own preferred approach to empowerment through education has always been helping small-scale farmers and entrepreneurs learn how to operate their farms and businesses more effectively. Transferring knowledge and technical skill to these people, and increasing their exposure to others experiencing and overcoming the same problems, is never wasted. Working with those who are most ready to make change also builds in a multiplier effect as other members of their communities, who may be reluctant or unable to try new things, learn from those who succeed first. ← Still in the Saddle! Our government and private sector entities are looking to technology to solve the grand challenges of our day. However, we all know that change starts at the beneficiary level as change must be searched for, desired, and then obtained via personal sacrifice and ownership. The technology is being addressed and ‘on-its-way,’ but the big concern is even if the technology was here today, Emerging Nations are not ready for it. 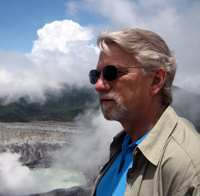 Thus the purpose of my blog and the company I work with – Genesis Nanotechnology. Gary, I have some other ideas I’d like to share with you for your Immigrant Challenges there if France. I’ll address those via LinkedIN. This is a very strong read, explaining prosperity in terms of inclusive and extractive political and economic institutions, and arguing in the long run that extractive institutions and states fail, although they may be prosperous for a time with a reallocation of resources and a strong central government, but even that tends to discourage innovation and acceptance of “creative destruction”, i.e., giving up on old practices that should be replaced by innovative technology, but which remain in place to preserve economic benefit to particular elites that otherwise will be lost. Some of this has been around for a while – e.g., you want to have a level playing field, as well as avoid creation of rent-seeking opportunities, but this pulls the thinking together well. One element that I am not sure is given sufficient weight is the influence that certain individuals can have at a point, such as George Washington’s non-elitist attitude on becoming president of the US, or the particular chiefs who were in charge and decided to negotiate with the British on behalf of what is now Botswana – not clear that the outcome would have been the same if another individual had been in this type of critical position. I think the book could have been shorter, as there is a lot of repetition, but overall it is highly readable and should be read by anyone involved in international development. As you can imagine I have thought a lot about it over the last couple of years, and I did think that the last chapter, which comments on development aid, could have been harder-hitting – how can it be designed to make institutions more enabling and inclusive. I suppose that is the next book, and it a lot of what you are trying to get at – what works. The persons in the country itself are going to have to make changes to encourage inclusiveness, and it seems clear that outsiders can only scratch the surface in encouraging this. Mary, I always appreciate your thoughtful comments. I have been thinking a lot about the “last chapter” issue as well. Perhaps we don’t really want the forward looking questions to be settled by the academics. I have certainly seen enough projects designed by academics, politicians and bureaucrats in my career to last a lifetime. And I expect many of us have sat through enough conferences on “how to do development” that included no one with actual field experience among the various panels of talking heads. There is certainly a place for historical analysis such as is presented in Why Nations Fail and for the gathering and analysis of economic data to gauge results but we also need to hear (and consider) more of the real operational experience of people in the field as to what works and what doesn’t if we are to expect to improve on past results. What other books have you read recently that you might recommend to me and others in this group? Gary, To be honest I mostly read novels and could recommend some excellent ones, but I don’t think that is what you are looking for! I think that full books on a lot of non-fiction topics are too much, too long – even this one which I think was excellent was a lot longer than it needed to be to make its point. Overall long magazine pieces may be more on the mark. The New York Times has an interesting free e-mail newsfeed called “What We Are Reading” with links to items that its editors and writers found worthwhile, and that is a great lead on good stuff, although of course is not focused only on development. I will forward one of the e-mails to you directly.